Subtitle: Cato’s Letter No. 62. On Liberty, January 20th, 1722. I closed a recent squib with, “They (the writings of Sidney, Locke, Tacitus) bolstered what liberty-loving Americans had experienced and looked forward to: happiness in a natural equality among self-governing, God-fearing men.” As for Locke, colonial Americans absorbed his philosophy and much more through Cato’s Letters: Essays on Liberty, Civil and Religious, a series of entertaining newspaper opinion pieces (1720-1723) by two Englishmen, John Trenchard and Thomas Gordon. The namesake of their work, Cato, sought to save the Roman Republic through his oratory. Similarly, Trenchard and Gordon’s pen and printing press raised the alarm over threats to English liberty. No deserving politician escaped their exposure and ridicule. The Cato of Trenchard and Gordon described liberty as that power every man has over his actions. It is the right to enjoy the fruits of his labor provided he doesn’t hurt society or restrict the liberty of others. He cannot be relieved of his property but by theft or his own consent. Cato’s liberty is very close to, if not indistinguishable from, today’s Libertarians. Thus, the magistrate is far more limited and restrained in his public capacity than any man in his private actions, for all actions of the public person, wrote Cato, “being for the sake of society, must refer to it, and answer the ends of it.” Reflecting on the recent Deep State crimes against society, tears well up in my eyes at times while reading Cato. Tyranny may emerge from several sources, and one of them is majority abuse of the minority. It is a mistaken notion in government, wrote Cato, “that the interest of the majority is only to be consulted, since in society every man has a right to every man’s assistance in the enjoyment and defense of his private property; otherwise, the greater number may sell the lesser, and divide their estates amongst themselves.” Democracy is a conspiracy of the many against the few. Is this not what passes for American government? Whose property is secure from majoritarian theft? Cato slams the nanny state. The purpose of government is to protect the law-abiding from the lawless. It therefore has nothing to do with man’s domestic affairs, his thoughts, conscience, religion. Men’s thoughts are not subject to government’s authority. Cato writes, “Let people alone, and they will take care of themselves. If they do not, a sufficient punishment will follow their neglect.” Society can only prosper when government treats men as men and not as children. Official intrusion into personal affairs, thoughts, and imaginations of the public mislead people, and pick their pockets under the false pretense of the private and public good. True and impartial liberty is the right to pursue the natural, reasonable, and religious dictates of his own mind, and to think what he will, and act as he thinks. In contrast, the modern nanny state, in the name of the public good, prosecutes unwitting victims for Thought Crimes. Civil government, writes Cato, “is but a partial restraint put by the laws of agreement and society upon natural and absolute liberty which might otherwise grow licentious.” The term “license” fell from America’s lexicon decades ago. License is the corruption of liberty; it is the absence of self-restraint. A society without self-restraint isn’t a society, but rather a collection of beasts who only recognize force, and force alone to limit their actions. Tyranny is an unnatural restraint on natural liberty. Magistracy among free people is the exercise of power for the sake of the people. Free government protects liberty through stated rules. Tyranny is a brutish struggle for unlimited liberty for the few who would rob everyone else of their liberty. Cato noted that without liberty, life is precarious, miserable, and intolerable. Liberty is to live on one’s own terms; slavery is to live at the mercy of another. As the parent of all other virtues, liberty renders free societies different from those under tyrants. Small armies of Greeks and Romans often vanquished great hosts of slaves. In contests between men and sheep, sheep will lose. A society that cherishes liberty will likewise treasure citizenship, and not dilute this precious jewel. The consequences for ignoring this maxim are on display as the previously virtuous, but now corrupted societies of Sweden, France, Germany, and the UK fall to the barbarian slaves of Allah. Liberty is the source of human happiness. Liberty encourages population growth and productivity. Countries are generally peopled in proportion as they are free. On a tract of land that supports a hundred thousand freemen in plenty, five thousand slaves will starve. While Liberty naturally draws people toward it, slavery drives them away. Great cities which lost their liberty become deserts. Detroit. Certainly, there are some great cities of slaves, but these are strictly imperial cities, the seats of despots who draw the wealth of a continent to their capital, like Babylon, Antioch, Seleucia, Alexandria. Doing so is always a confession. By granting special privileges to favored cities, tyrants get away with abusing the countryside. Notwithstanding the efforts of President Trump, Washington DC and surrounding counties are the republican equivalent of Cato’s despotic Imperial Cities; they do not thrive because their people produce wealth, but because they extract the wealth of the nation. The means to societal happiness aren’t complex or unintelligible; the American experience in liberty and free government is right before our eyes. As President Trump continues to drain the swamp, We the People must secure and protect his accomplishments. His legacy cannot endure beyond his eight-year term until we restore and reinvigorate the senate to its Constitutional duties. This restoration of the senate to its proper place in our republic is prerequisite to the restoration of liberty. Source: Cato’s Letter No. 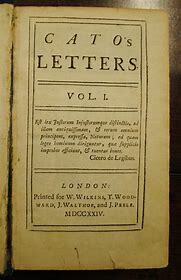 62, January 20th 1722., An Inquiry into the Nature and Extent of Liberty . . . and the Vile Effects of Slavery.